A Saint Albans tradition. Come out and enjoy our annual Christmas parade, which follows a route down Sixth Avenue and up to Main Street. 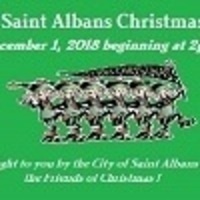 Santa and Mrs. Claus will be there, along with displays of the season by the best and brightest that Saint Albans has to offer. Spectators can watch beginning at 2pm. Participants: If anyone wishes to participate, please contact Patty Swango at (304) 549-4100. Lineup will be at 1:30pm beginning at the Hansford Center.